Free nights are the holy grail for travelers. But if you are like me, you never rack up enough points to redeem free nights at hotels. I don’t always stay at the same hotel chain when I travel. In fact, discovering new and unique hotels is part of the travel adventure for me. So my hotel points usually expire before they add up to a usable amount. When I was traveling around the world last year, I discovered that Hotels.com gives you a free night for every 10 nights you book through them. The free night will be for an average of what you paid for the 10 nights. Since I was on the road for over 3 months, I was able to redeem a lot of free nights. It was thrilling to finally be among the ranks of people who can claim free hotel nights. Hotels.com has a handy app available for smartphones. After you create an account on their website, you sign in to the app and save your payment information. Once that is set up, you can book a hotel in less than a minute which is really convenient. The app allows you to search for a hotel in a city and refine by price, number of stars, neighborhood, etc. 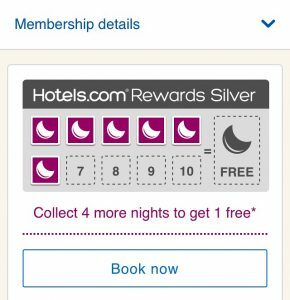 Occasionally, there are additional discounts for booking through either Hotels.com or their app. I generally sort hotel listings by guest reviews. I only consider hotels that have over 4 user stars as that usually indicates high quality and/or good customer service. The app also includes reviews from TripAdvisor users whom I trust more than any others. I have found many hidden gems through this app. I used the app literally all over the world and I never had any issues with it. There are other good sites for booking hotel rooms. However, Hotels.com has the most straightforward rewards that I have seen. So head out and explore the world. Live young and travel.